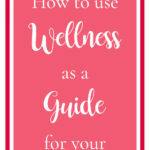 When we talked about wellness in homeschool, we broke down the eight dimensions of wellness. While all eight dimensions are important, financial wellness is one of the most important in my book. 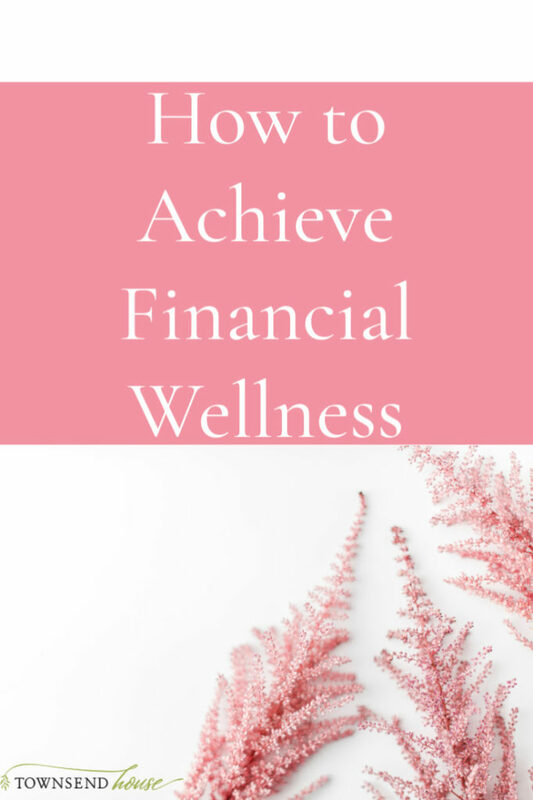 Financial wellness directly correlates to whether or not you are emotionally well, whether you are happy with your environment and occupation. It connects to almost every other aspect of wellness directly. If you do not have financial wellness, overall wellness will be difficult to come by. As homeschoolers we have unique challenges. Most of us have chosen to become single-income households so that one of us can stay home and educate our children. This causes immediate stress on financial wellness. The reason? Our society is set up to accommodate double-income families. I don’t want to get into a big discussion about how the prices in America have risen dramatically over the past 30 years, it is kind of a hot button issue for me as a SAHM and economics major in college, so feel free to e-mail me if you would like to discuss anything economics related! When you become a single-income family, you have some tough choices. And when you also are homeschooling, the choices become even more difficult. The reason is that we have taken on the responsibility of educating our children. Because of this, we know that we need to invest in the curricula and tools in order to make that a successful choice. We can still successfully teach our children even if we do not have money to buy the huge boxed curriculum. It also means that if we decide to cut other things so that we can buy all of the books, that is OK too! We briefly discussed this when I explained my word of the year is wellness. Financial wellness is simply when you handle your finances successfully. Yes, this means that financial wellness is all about having a budget, investing in retirement and kids’ college, and not living paycheck to paycheck. Financial Wellness in homeschool families can be a struggle because we are that single income family. We have taken on the responsibility of educating our children, and need to pay for that, as well as keep our homes afloat. And when there isn’t financial wellness in your home, there is stress. Scarcity breeds stress. It is stressful enough educating and parenting our children! We shouldn’t also need to worry about financial wellness. I recently read that 78% of Americans live paycheck to paycheck. In other words, they are unable to meet their financial obligations if they become unemployed. There are so many of us in the homeschool community that struggle with this as well. We all want financial wellness for our families, and this month we are going to work together to come up with some solutions and put us all on a better path to financial wellness. Now, if you are one of the people that does not struggle with financial wellness, that is amazing! My husband and I have been on our own financial wellness journey for many years, and we feel much better now financially then when we had our second child 8 years ago. 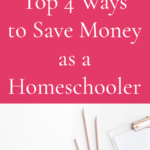 I hope that you will still join us because I have some amazing resources coming up to help us all save a little money when it comes to homeschooling and life in general! Where does Financial Wellness Begin? Financial wellness starts where all finances start – not at getting a job or making more money, but budgeting. I will let you in on a little secret here – I love making numbers work. So, I am happy to be partnering with you on this financial wellness journey! A budget is not something to be scared of. In fact, it ought to be something you love. You are telling your money where to go, instead of it mysteriously leaving your presence. If you are strapped for cash, or someone who struggles to pay their bills, a budget is going to help you figure all of that out. In the simplest terms, creating a budget means listing out how much money you expect to make over a month, and then listing out how much your expenses are. Those two numbers should end up equaling zero. Whether this means you need to cut some of your expenses, or if you need to put money into sinking funds or savings, the final number ought to be zero. Now, does having a zero-based budget mean that you will have financial wellness, the answer is no. The reason being that you may have areas in your budget that can be cleaned up. Do you have a lot of debt? Are you saving for retirement and do you have an emergency fund? All of these will also factor into financial wellness for your family. This is a very important part of financial wellness – make the budget with your spouse. It doesn’t matter if one of you is not financially minded, you both need to sit down and work together. It is hard, there will be fights, everyone has a different opinion about how money should be spent. However, it must be done. If you don’t take this first step in creating a budget with your spouse, you will not achieve financial wellness in your home. If you don’t have financial wellness in your home, that will cause stress in your homeschool. Why? Because you are always going to be cutting corners on educational expenses because that is something you can control. You want your children to have the best. This does not mean you have to spend a lot of money on different curricula, but you do need to be able to buy the items your individual family needs. A budget is only the first step in financial wellness. After you have a budget, you need to figure out what your financial goals are. Is debt the issue? Do you want to save more money? Perhaps you want to save for a vacation? Maybe you need to build up an emergency fund, or even start saving for your kids’ after high school endeavors. Whatever the goal is, write it down. Make sure that it is visible and concrete. Money goals and financial wellness are pretty easy to measure. You have a specific dollar amount you are working with, and timeline on how to get to that point. Did you look at your budget and think “what a mess? !” You don’t have enough money at the end of the month and you don’t know how to cut your expenses further. If this is the case, I recommend that you pick up the book The Total Money Makeover by Dave Ramsey. It lays out step by step how to create a budget, how to stick to a budget, and how to win with money. Honestly, it is a great book that I think every person should have a copy of. His process can seem extreme, but it has worked for many people, and it breaks down the steps into very manageable chunks. What do you think of when I say financial wellness in your homeschool? Does it seem absurd to you? What I mean by financial wellness in your homeschool is having a strategy to successfully get all of the supplies, curricula etc. 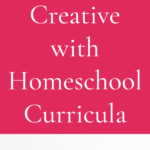 for what your individual homeschool needs are. It sounds like a lot, right? Not only are you responsible for directing your child’s education, but you are also responsible for giving them the tools they need. This can be extremely difficult in large families, it can be hard in small families as well. Have you ever purchased curriculum to use with a child, gotten three weeks into it, and realized that it is the wrong choice? But, now you have spent $100 on this curriculum, and you feel guilty about spending the money. So, instead of finding something new – because buying new curricula is expensive! – you power through with your student and hope for the best. All the while, you know that it isn’t a good fit, and you and your child are barely making it through the lessons each week. What can you do? From a financial wellness perspective, you want to be able to then purchase something different, or find something different that will work with your student. Does this mean that it has to be bought new? Absolutely not. We will be going through some ways to find a good curricula path that you can easily afford throughout this month. We will also be working on saving money in other areas so that you do have the money available when you need it for your homeschool. You may already have financial wellness in your home and homeschool. Knowing that you have the money to purchase what you need is amazing security for you and your kids. However, sometimes this can mean that you jump from curriculum to curriculum trying to find “the right thing.” Or perhaps you do not have financial freedom, and you feel pigeon-holed into finding inexpensive curriculum, but it doesn’t work the “right” way for your kids, so you jump to something new. Maybe the problem is that you think something will work great, it doesn’t, and you need a change? The deeper struggle here is not necessarily financial wellness, but instead the comparison trap. 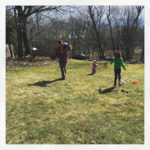 The most amazing part about homeschooling is the freedom it brings your family. You are able to choose the path for you and your kids. The most difficult part of homeschooling is the freedom it brings your family. Freedom means that you can make any choice you want, whatever you think is best. However, when there is no exact measure for what your child should be doing each year, that is where freedom can become difficult. Because of this freedom struggle, you may jump from curriculum to curriculum because you don’t know exactly what you ought to be doing. You know that you don’t need to compare your child to the public school, in fact you want to break out of that public school mindset. But, where do you go from there? Financial wellness in your homeschool is going to be a process. We are going to need to write a budget, and we are going to have to take a hard look at where we are financially in order to find that financial wellness. But, we are also going to have to let go of comparison. You need to sit down and flesh out exactly what your specific homeschooling needs are. What exactly do your kids need from you in order to be successful. Finding that freedom in homeschooling is amazing, but complicated. You need to be able to shield your eyes from the shiny objects, and make sure that you are choosing the right path for your individual students. This is something we will be talking about as we go forward together. Will it be challenging? Absolutely! But you and your children will be better in the long run for it. Where do your kids come in? Part of financial wellness in your homeschool is going to be teaching your kids about finances. Why? So that they are able to become successful adults out in the world. There are so many people that do not understand money, that you have to earn it and then you have to tell it exactly where to go. Financial wellness is going to be about showing your kids the way to save money, the way to stretch a dollar, budgeting. All of that is going to come into play for your kids. Financial wellness in your homeschool will show them the responsibility that you have taken on. And it will also become something they can look back on as an example of what to do or not do in the future. It also means having the ability to give your child the right tools, and that is going to be the most memorable part for them. Knowing that they have the ability to find what they need in order to have a successful homeschooling career. Your homework for today is simple (but not easy!). You need to print out the last three months of bank statements and go through to write a budget. Do you need help with a budget? I am more than willing to help you if you need it! Just e-mail me! If you already budget every month – AWESOME! Instead of writing a budget, I want you to write down all the money you spent on curriculum and supplies this year. Write it all out in detail, even the school supplies. You will need to know this amount as we move forward through this month of financial wellness in your homeschool. We love Dave Ramsey too! 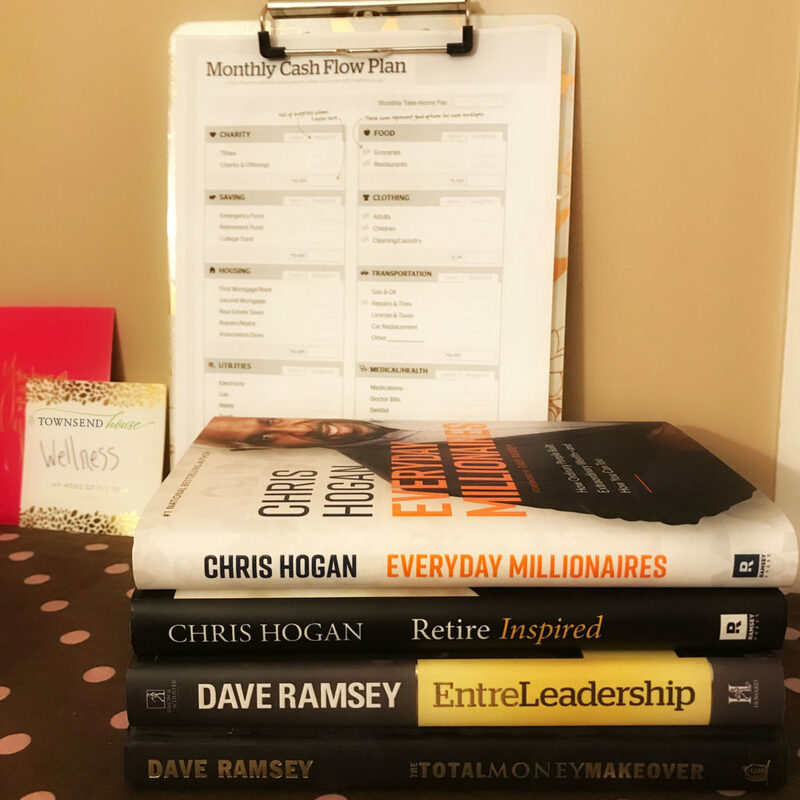 The financial guru with SO many great money saving tips 🙂 I haven’t heard of Chris Hogan but I’ll definitely check him out!